As we become more and more connected, it is harder to leave behind our electronic devices, even when we are immersed in nature’s splendor. 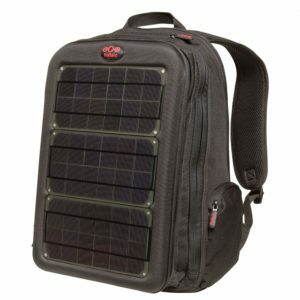 The following are my picks for what to look for in a solar backpack and several good choices in what to get depending on what you need it for. 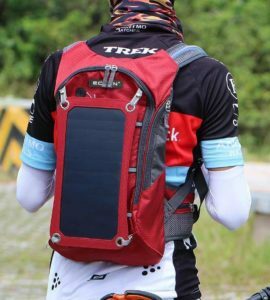 Solar panels get better and better every year and they have finally gotten to a point where you can add solar panels to your backpack and as long as you are outside in the sun, keep your phone and other wearable electronics fully charged. Who doesn’t want to help out Mother Nature? You have to use this a good bit to offset the initial carbon footprint cost of manufacturing this item, but as long as this is a well-used item by you, you can count on free energy from the sun without causing any harm. Enjoy nature and help preserve it at the same time while staying connected off the grid. More and more jobs require people to be outside for the jobs with devices that require power. Battery packs are a must in these situations, but including a way to charge keep these devices and battery packs charged gives you one less thing you have to worry about. Do a lot of biking or hiking and want to make sure all your electronic devices stay charged? Doing some extended Pokemon Go playing and want to make sure your device lasts? You are already out in the sun with a backpack, might as well use all that free energy beaming down on your pack. Do you need to keep a tablet, phone, GPS, flashlight, radio, digital camera, GoPro or one of hundreds of other electrical devices? The whole point of backpacking is to allow travelers to see and experience more of a place, while keeping costs down to a bare minimum. It’s more than just an alternative mode of travel; it’s a lifestyle. But while some people can readily adapt to backpack travel, others may find the whole low cost thing a bit discomforting. They would often spend way more money than what is necessary, thus throwing the real essence of backpacking out the window. Going on a budget trip does not mean putting up with shady hotel rooms and crappy meals. For the backpackers out there who have trouble sticking to their travel budget, the tips below should make your every penny count for that dream trip. Nothing is worse than owning a bad backpack: your belongings could easily get drenched in a thunderstorm, your clothes could spill out at the most inopportune moments or you could get sore from having ill-fitted straps digging into your shoulders all day. When it comes to backpacks, bigger does not always mean better. Make sure what you choose is proportional to your size; the thing here is that the weight should be balanced evenly on your back so that you won’t experience backaches when you lug your backpack around for the duration of your trips. Most sports/camping supply stores will allow you to try on their backpacks with weights so you can see if it’s a comfortable fit for you before purchasing. A good backpack is one that can withstand the rough-and-tumble of backpacking trips. It should be water-resistant, multi-compartmented, have a sturdy internal frame and padded shoulder straps. But don’t go for those that are priced over $250 – these are unnecessarily expensive. There are decent backpacks that will only cost you anywhere from $100 to $200. This is a no-brainer. The rule of supply and demand is always at work when it comes to airfare and transportation costs. The summer season can be a great time to travel, but it’s also the most expensive compared to other seasons throughout the year. If you must travel during a lean season, book flights early to save yourself from the skyrocketing prices later on. Also, you might want to travel during weekdays, when flights are priced cheaper. Every camping trip always begins with packing up your bags with clothes and other essential stuff you would need while you’re spending the weekend in the wilderness. Unlike in a brief vacation or business trip, a camping trip calls for the use of tougher and bulkier camping backpacks. These bags are specially designed to withstand the effects of rough handling and the harsh elements. Plus, you’ll have more space and better security for the things you’ll need to eat, sleep, drink and be clean at camp.